This Stylish display area was recently completed on tight time frame with a specific brief for colouring and branding. Let’s be honest nothing is more exciting than an opportunity to Create a custom solution! 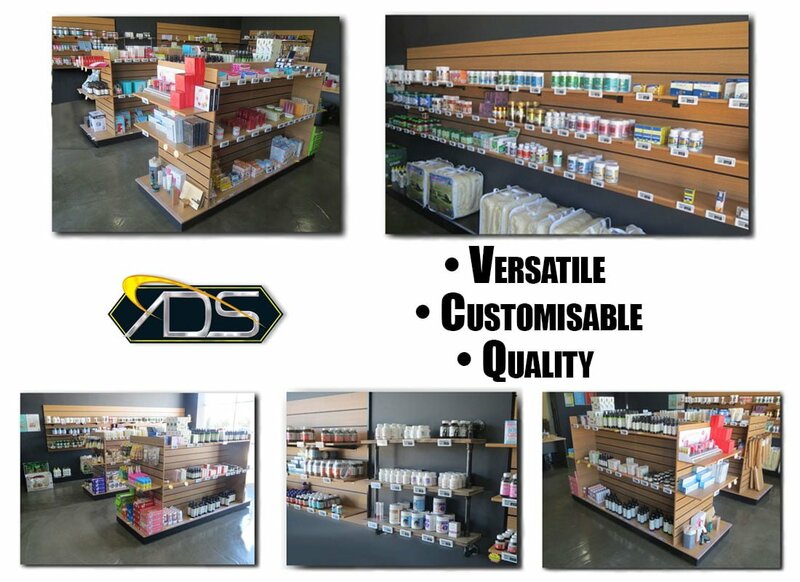 A company with a vision to create a clean and modern display area. With no time to lose Advanced Display Systems set to work designing a display solution that suited the client’s needs. The ADS team created a display system using Slat wall panels, Vivo Gondola system & Slat wall accessories. This offered the functionality the health store was requiring to cater for their product range. We offer Custom shelving units with a unique feel, if you’re interested in this service just contact the team to organise a design consultation. The ideal display for retail merchandising, create a flexible system to suit a range of products. An opportunity to incorporate branding with colour selection, graphics & signage. This classic system allows you the opportunity to customise a display to show off your range! This freestanding display system allows for any display configuration, while providing maximum retail/merchandising efficiency. The stylish display system provides you with all the tools to present your products to their fullest potential! Components available in Stylish Chrome and clear acrylic in a variety of styles, shapes and sizes! As a leader of the display industry for over 25+ years we are confident we can provide a display solution to suit your needs.